Using personal devices for work is the norm these days. Chances are, the majority of your employees have their email synced to their phones. On weekends, they use their personal laptops to check a few items off the work to-do list. While waiting in line for coffee, they respond to work emails. In many ways, this is a positive development for businesses. Research shows that employees who use personal devices for work put in more hours overall. They send more emails per day — 20 more than those who don’t use personal devices for work — and check email before even heading into the office for the day. Plus, they’re more available. An employee who is traveling but still able to communicate with the team is obviously preferable to a completely absent, off-the-grid employee. But as cyber attacks increase and personal devices become ever-larger fields of data for hackers to mine, companies have begun to wonder if the benefits of BYOD (Bring Your Own Device) — increased productivity and connectedness — are worth the risks. We broke down the risks of BYOD and how you can reap the benefits while managing the challenges. Here are the main risks of allowing employees to use personal devices for work, as noted by Inc.
Employees losing devices. It happens all the time: someone misplaces his phone; a laptop is stolen. With all the information phones contain — saved passwords, personal information, addresses and more — a lost or stolen phone is a big security risk for a company. In the hands of skilled hackers, even password-protected phones can put valuable information at risk. Unsecured WiFi. An employee is in line at her regular coffee shop on her way to work. Her phone automatically connects to the shop’s WiFi, and she responds to a few emails. If a hacker happens to be in the coffee shop and the WiFi isn’t secured, that hacker now has access to both the employee’s and the company’s data — all of it. The same is true in various public places: airports, restaurants, libraries and more. Employees leaving the company. Even after an employee leaves a company, their phone or laptop still contains a bevy of company information. Unless that information is cleared out, it remains vulnerable to misuse. Out of date devices. How many times have you delayed updating your phone with the newest software? We’ve all been there. But when devices and the software on them aren’t kept up-to-date, they’re easier to hack into. Out-of-date firewalls and anti-virus protectors aren’t as strong. Non-updated personal devices are a great risk for companies. 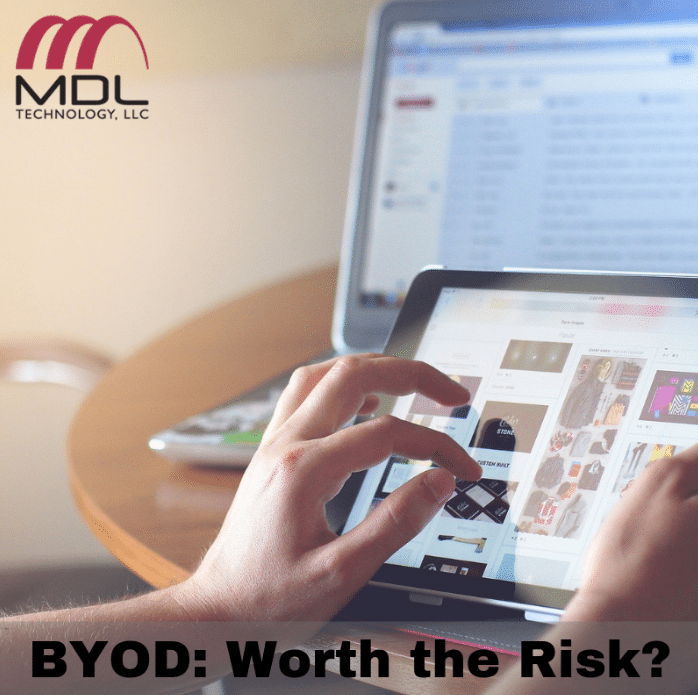 However, just because BYOD poses risks for a company doesn’t mean it shouldn’t be an option. Some companies are urging a push from BYOD to CYOD — Choose Your Own Device. Rather than allowing employees to bring their own devices into work or use them from home, they can select work devices from a pre-approved list. This way, companies can ensure that work devices are up-to-date and utilize the best cybersecurity possible. For companies that have the funds to do this, it’s a valid option. But for those that simply can’t afford to give every employee a new phone, we recommend finding an expert to provide enterprise mobility management. It’s important to manage devices, applications and information when it comes to personal devices used for work. Devices must be secure but still user-friendly. At MDL, we provide the expertise necessary to walk this fine line and keep your company secure while still reaping the benefits of BYOB. We maintain an inventory of your devices and the various operating systems and applications on them, keep view over the devices and provide help when needed. When devices are lost or stolen, we are able to wipe them clean of key data. We do all of this without interrupting workflow, which means employees can stay productive all day without putting your business at risk. If you are a small business looking to improve cybersecurity without cutting into productivity or profits, contact MDL. Learn more about our enterprise mobility management services on our website.